Mornington Road in 1895 was at its best: a tree-lined grove with 20 grand houses standing on its west side, these houses less than 40 years old; and on the east at the corner with Bow Road stood a grand Presbyterian Church, next to it a church hall, and a terrace of 28 handsome red brick houses, some of which had only just been built. Railway development was a confusing and chaotic process, but there came a time when the growing underground railway had a District Line that terminated at Whitechapel, but was seeking to penetrate further east. The London Tilbury and Southend Railway had a terminus at Fenchurch Street, but was looking for better access into central London. It was decided that the two could join by building a link between Whitechapel and Bromley station. From Whitechapel the railway would be underground along the Whitechapel Road, the Mile End Road, but shortly after entering Bow Road it would begin to rise up from underground and head south east so as to engage at high level with the London Tilbury and Southend Railway at a junction by Campbell Road. The Whitechapel and Bow Railway Act was passed in April 1897. It was only two miles long, but once the Act was passed, all hell broke loose on the north end of Mornington Road. In this detail from the 1899 Official Railway Map, J & W Emslie, the Whitechapel & Bow Railway, still under construction, is shown in dotted yellow and white as the joint endeavour of the London, Tilbury and Southend Line and the Metropolitan District Line. – Railway, commencing in the parish of Saint Mary Whitechapel, by a junction with the Metropolitan District Railway, at a point under the parapet wall on the east side of Vallance-road 16 yards, or thereabouts, measured in a northerly direction from the eastern corner of Whitechapel-road and Vallance-road, and terminating in the parish of Saint Leonard Bromley, by a junction with the London Tilbury and Southend Railway at a point at the western end of the bridge carrying the London Tilbury and Southend Railway over the North London Railway to the east of Campbell-road. … To work the said intended railways by steam or electric power. The intended railways will be made or pass from in through or into the parishes of Saint Mary Whitechapel, Saint Matthew Bethnal Green, Hamlet of Mile End Old Town, Saint Mary Stratford-le-Bow, and Saint Leonard Bromley, or some of them, in the county of London. – the stopping up and diversion of the streets or roads known as Arnold-road, Archibald-street, and Eleanor-street, and to extinguish all rights thereover…. To enable the Company to acquire by compulsion or agreement in addition to any other lands, and to use for stations, sidings, erection of houses or buildings, or other purposes …. Lands with buildings thereon, in the parish of Saint Leonard Bromley, including Mornington-road and the houses and premises on both sides thereof, and bounded on the south by Archibald-street, and on the north in part by Bow-road and in part by the chapel and County Court buildings at the corner of Mornington-road and Bow-road. Under these powers, a third of the housing in Mornington Road was purchased and destroyed. The hump of a railway bridge arose and a new stretch of street, Eleanor Street, was built to fork off left alongside the new railway as it rose to ground level. The map shows the District Line works superimposed on the street as it was. Nos. 1-4 of the grand houses on the west side destroyed; nos. 28 – 43 on the east, some of which were only a few years old, were razed to the ground. At the N end, close to Bow Road, WELLINGTON BUILDINGS, two blocks of tenements with projecting bays for staircases, originally open, under pointed gables. A low range on the s side of the courtyard was originally for a laundry and bathhouse. 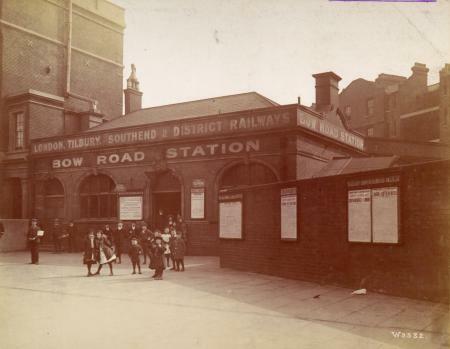 Built 1900-1, by C. A. Brereton, Engineer to the Whitechapel and Bow Railway, to house residents displaced by the building of the railway line and BOW ROAD STATION (opened in 1902). the works of the Bow and Whitechapel Railway had met with great difficulties, one of which had been the impossibility of obtaining possession of the properties required until provision had been made for the housing of the displaced working classes. As regarded this matter, he might tell them what the result had been in this particular case, and in all the cases he knows of – that, having acquired the land and property at great cost, and having been kept waiting by the Home Office months and some cases years, it was found that the classes displaced would not live in the new buildings, and that other working classes would only live in them on their own terms. They had very few occupants, either present or prospective, for these buildings, and the possible rent they would get would not return 1 per cent. on the capital. This was the philanthropy of the philanthropist who had not to find the money. – to Parliament as assenting to the proposed undertaking, dissenting from it or neutral in respect thereto. This meeting instructs the Clerk to ask the Trustees to report as dissenting from the scheme. I have this day completed the sale of the Ground Rents to the Whitechapel and Bow Railway Company. The purchase money which has been paid into the Court amounts to £4,850. In addition I have received £724.14.0. in respect of interest including a small addition in respect of adjustments for rents during the last three years. The Company have also paid my Costs amounting to £58.10.10 and has agreed a fee of £39.18.0 for the Surveyors. On completion I have handed over seventeen counterpart Leases in respect of the following properties. Part of the garden of 25 Mornington Road and the following houses, all included in a lease of the 25th April 1889 with other property retained by the Trustees, viz. On 14th September 1904 the Quakers of Ratcliff and Barking MM used about half the proceeds of this sale to buy property in Sugar House Lane, Stratford, London E. And then, on the 10th February 1905, report is given to the Quaker meeting that there is the opportunity to buy back such parts of the Bow Estate that the Railway Company found surplus to their requirement, comprising 4 houses. I am glad to be able to report that we have arranged for the investment of the balance of the Bow Road money. At the latter part of last year we ascertained that the Railway Company were putting up for sale as surplus land some part of the property which they had taken from us under their compulsory purchase. It seemed to your committee that it was very desirable to, if possible, purchase some part of the land at any sale and in conference with Rutland Saunders they decided to endeavour to carry this out. The sale was postponed until the 9th day of the present month so that gave an opportunity of going carefully into the matter. The result was that Rutland Saunders were able to agree with the Railway Company for the purchase of Nos. 26, 27 & 28 Mornington Road and No. 50 Bow Road at a price of £2,600. The properties are all let and are bringing in at present what seems a fair return for the money and a prospect of some improvement in the case at any rate of 28 Mornington Road. According to the Post Office Street Directory, nos. 5 & 6 were still extant. With that survival Mornington Road now comprised nos. 5 -20 on the west side, and nos. 21 – 28 and 44-48 on the east side. Destroyed, gone forever, were the four grand houses numbered 1 – 4 on the west side, and 15 homes out of the two terraces of elegant red brick houses on the east side, nos. 29 – 43, some of which houses were still brand new. Out of an elegant street of 48 dwellings, 19 had been lost and the road turned into a fractured remnant of the original. Five more would be destroyed in the Blitz, and four more would go to make way for the Thames Magistrates Court.